A pirate, a vampire, and Cyclops from the X-Men. These are a few of my favorite costumes I wore as a kid on Halloween. I believe this time of year presents our children with a tremendous faith-learning opportunity where the emphasis should be not on Halloween itself but on the Feast of All Saints. They need to know the history of All Saints, its tacit connection to Halloween, and how it has become distorted by the secular culture. In a nutshell, the Feast of All Saints was established shortly after the implementation of religious pluralism in the early 4th century. During this time, Christians desired to formally honor the martyrs who gave their lives for the faith, and the Feast of All Saints was established and celebrated on May 13th. In the year 844, Pope Gregory IV moved the Feast of All Saints from May 13th to November 1st, where it remains to this day. This is where the connection to Halloween comes in. “November 1st marked Samhain, the beginning of the Celtic winter. Samhain was the Celtic lord of death, and his name literally meant ‘summer’s end.’ Since winter is the season of cold, darkness and death, the Celts soon made the connection with human death. The eve of Samhain, October 31st, was a time of Celtic pagan sacrifice, and [the Celts believed that] Samhain allowed the souls of the dead to return to their earthly homes that evening. Ghosts, witches, goblins, and elves came to harm the people, particularly those who had inflicted harm on them in this life. […] To protect themselves from marauding evil spirits on the eve of Samhain … the Druids (the priests and spiritual teachers of the Celts) built a huge new year’s bonfire [and] offered burnt sacrifices [of] crops, animals, even humans. People sometimes wore costumes of animal heads and skins” (Reverend William Saunders, “All Saints and All Souls,” Arlington Catholic Herald, 2002). Despite the spread of Christianity throughout the known world, the collective memory of some of these Celtic customs remained. Hence, the Christian Vigil for the Feast of All Saints, or All Hallows Eve celebrated on October 31st, became Halloween. Instead of observing the Christian custom of remembering deceased loved ones in a special way, the culture exploited elements of pagan rituals and practices to create what has become a pseudo-holiday. 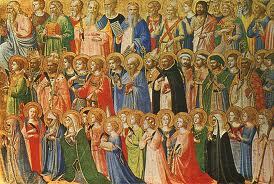 Nevertheless, it is clear that All Saints day evolved out of a purely Christian ethos and not from pagan idolatry. Then what should we do about the kiddos? To what extent and level parents choose to inculcate Halloween into the lives of their children is a prudential decision. However, Halloween is an occasion to help children not only appreciate the true significance of this time of year, and to remember and honor those who have gone before us marked with the sign of faith (i.e., baptism) but also challenge them to become saints in their own lives! In order to become saints, we don’t need to be great theologians like Saints Augustine or Thomas Aquinas. We don’t need to be martyrs like Saints Felicity and Perpetua. We don’t need to be great leaders like Saints Louis and Benedict. We don’t even need to perform great works of charity like Mother Theresa or Martin de Porres. In order to become saints, we must allow ourselves to be totally consumed by the fire of God’s absolute love. We become saints by fulfilling Christ’s command to love the Lord our God with our whole heart, with our whole soul, with all our mind, and with all our strength. To be saints means that we must seek union with the Father in love through the deepening and strengthening of our relationship with Jesus in the Holy Spirit. Jesus’ call to sainthood begins with his command to us: you must “be perfect just as your heavenly Father is perfect“ (Matthew 6:48). Holiness is a calling by God to share in His very life through desiring and striving for spiritual perfection in love. The way of holiness molds, shapes and forms us into the Body of Christ–into Jesus himself. To become a saint always involves a receptive listening to both the Word of God and to the Church. Saint Monica shows us that sainthood involves fervent and constant prayer, because it is only through prayer that we can come to know God better, and knowing Him better, we love Him better, and in loving Him better we find our true happiness in Him (cf. Thomas Merton, Praying the Psalms, 12). The more we “act under God’s Spirit”, the more we seek to know and to do God’s Holy Will in our lives, the more we implore the assistance and grace of the Holy Spirit, the more we grow in holiness and the closer we come to sainthood. Christ tells us that the road to sainthood passes through not only love of God but love of our neighbor as well. Like Saint Francis of Assisi, God chooses us, his saints, and sends us off on our mission. The world is the field in which the word of God is sown. Through our efforts as evangelizing saints–as sowers of the seed of the Gospel of Jesus Christ, as living witnesses to the goodness, beauty, and truth of our Catholic faith–the world will bear succulent, rich fruit. Yet, we may not know what fruit we are producing because it is God who picks and distributes the fruit of our labors! We may never know how someone was touched by something we said. We may never know how things turned out after someone has come to us for advice. We may never know how someone’s life was changed when they met Jesus in us. But as His saints, we know that “God’s love has been poured into our hearts by the Holy Spirit, and it is in this outpouring of love that the God who wishes to reveal Himself achieves his purpose and goals” (Hans Urs von Balthasar, You Crown the Year with Your Goodness, 209). Saint Therese of Lisieux once said, “In order to enjoy the merciful love of Jesus, it is necessary to humiliate ourselves, to acknowledge our nothingness, and this is a thing that many are unwilling to do. God wants humility of heart. When He sees that we are convinced of our nothingness . . . and appeal to Him, He stoops towards us and gives with divine generosity.” “Following Christ means going with him into the Father’s vineyard—the world—to share in the work of redemption” (von Balthasar, 211). In this world of sin and darkness, poor and humble saints shine brightly. Through them, the light of Christ ignites our hearts and inspires us to respond lovingly to the Father’s tender embrace. The bottom line is this: we are responsible and will be held accountable for teaching our children the faith and helping them to fall ever more deeply in love with Jesus. In our love of God and neighbor we too become saints, which should cause us to rejoice and be glad, for our reward will be great in heaven. Thank you! may the Holy Spirit guide our church to do right!